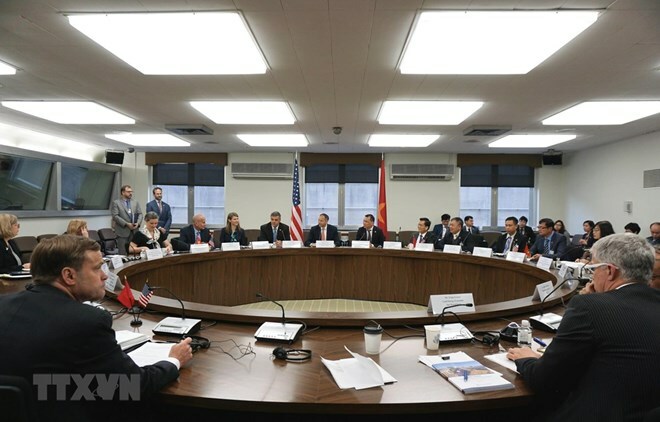 Washington D.C (VNA) – Vietnam and the US reiterated their commitments to deepening cooperation in energy security during their second energy security dialogue in Washington D.C on April 12. The Vietnamese and US delegations emphasised the centrality of energy security to sustained economic development in light of rising energy demands. Both sides affirmed the importance of improving the transparency and predictability of Vietnam’s energy sector investment climate through private sector-led development and regulatory reforms. US Assistant Secretary of State for Energy Resources (ENR) Francis R. Fannon Fannon offered continued technical assistance to support efforts to enhance the regulatory capacity of the Electricity Regulatory Authority of Vietnam (ERAV). Specifically, ENR will support ERAV with developing a competitive power market; smart grid and demand response programmes; and the regulatory tools necessary for competitive wholesale and retail electricity markets. ENR will continue to work closely with partners in the Vietnamese Ministry of Industry and Trade (MoIT) and the Directorate for Standards, Metrology, and Quality (STOMAQ) to increase energy efficiency in the region through technical engagements, and will seek ASEAN endorsement for voluntary best practices. The two sides further recognised the urgency for improving energy efficiency, particularly given that air conditioning comprises up to 50 percent of peak electricity demand in ASEAN countries and has a significant impact on energy security. MoIT Deputy Minister Dang Hoang An said the energy security dialogue mechanism between his ministry and the US Department of State was established two years ago, with the first meeting held in Hanoi in March 2018. This is the first energy security dialogue mechanism between ministries of two countries, he said, noting that it has created conditions for Vietnamese and US businesses to establish relations and accelerate joint projects. Through the dialogue, the two sides shared the views that energy is a potential sector that would help deepen the bilateral comprehensive ties, for interests of the two countries, and for peace and stability in the region and the world at large. The official suggested Vietnam and the US set up more official dialogue mechanisms in other spheres in order to push ahead with the implementation of specific cooperation projects between businesses of the two countries. Regarding renewable energy, Vietnam representatives discussed their pilot programme for Direct Power Purchase Agreements (DPPAs) that allows US corporations with 100 percent renewable energy targets to directly purchase electricity generated from renewable energy sources for their production facilities in Vietnam. In addition, the US Trade and Development Agency (USTDA) demonstrated its support for enhancing Vietnam’s storage capacity by funding a joint Electricity Vietnam (EVN)-GE Power study on the use of advanced energy storage technologies to reduce power shortages in Southern Vietnam. During the Dialogue, EVN and GE power signed an agreement to carry out that study. In the sphere of liquefied national gas (LNG), both delegations highlighted the US-Vietnam LNG workshop in Ho Chi Minh City in December 2018, which promoted securing stable LNG supplies for power generation and expediting investments in the LNG sector. The two sides discussed AES Corporation’s proposal to invest in the Son My 2 LNG-to-power project. The US Agency for International Development (USAID) highlighted its support for cooperating with MoIT on power sector reforms, increasing Vietnam’s renewable energy and storage capacity, promoting natural gas imports, and enhancing energy efficiency.